Roast beef sandwiches, strawberries & container with mayo for the sandwiches. We still have some leftover roast beef in the fridge so I made sandwiches for L today. I wanted to put the mayo into the sandwich but was worried that it may turn bad after a few hours, so left it in the container for her. 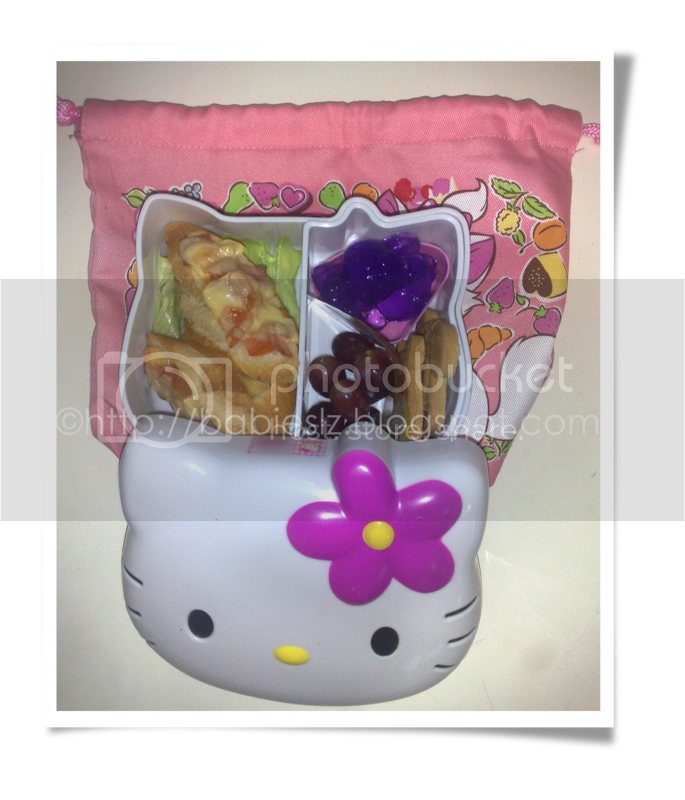 I also placed some cold packs in the bento box so that the sandwich will still be fresh when she goes for her recess. Z : Mommy, I have a suprise for you. Can you take out my computer file please? Me : Wow! You have a suprise for me! Can we see it later? Z : Can we take it out now? Z : How about now? 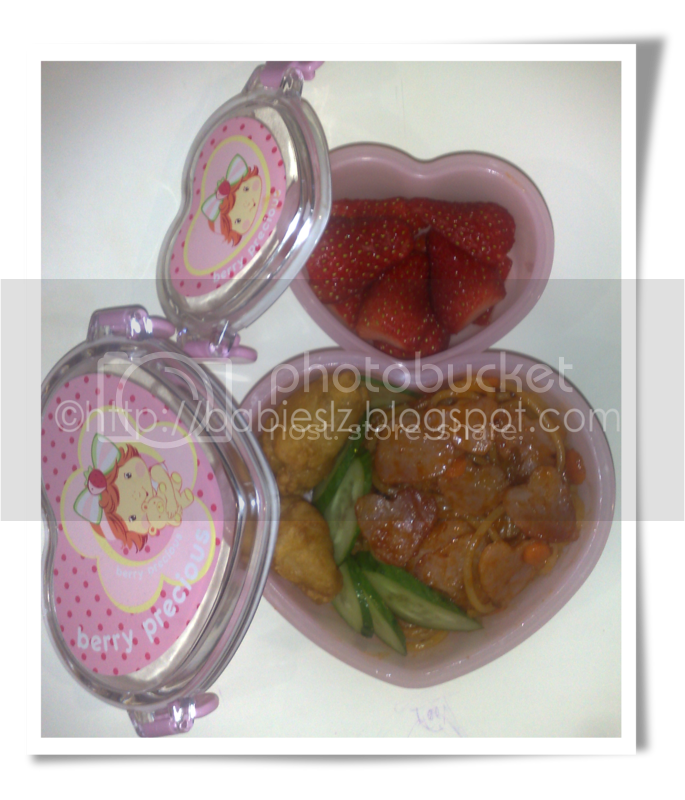 A simple bento: Spaghetti with heart-shaped ham, carrot, onion & tomato sauce, cucumber (as a divider) and nuggets. The other container with strawberries. I had tried a number of recipes and finally found one that I like and I made a slight change to it :) I can't remember where/how I got this recipe though.. I remembered some of you were asking for it, so here it is! Mix sifted flour together. Line baking tray. Preheat oven at 175C. Cream butter and add sugar in 2 or 3 additions till mixture turns pale & fluffy. Remove dough from fridge and roll out on slightly floured work surface. Cut out shapes with cutters. My poor boy.... It must have been very painful coz he was crying very loudly. At that time, jiejie was doing her homework and I was in the toilet. We rushed to him and found him sitting on the floor crying. While crying (before we came in), he actually put back the fan in the standing postion. He was worried that I would scold him for spoiling the fan but I was more concern of his hand. Our weekend baking - Peanut butter cookies. 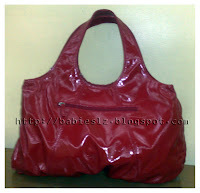 Thank you Fannie, for sharing this recipe with me :) LZ had so much fun making this. I did the mixing and they mould it. L told me I should add more peanut butter the next time. 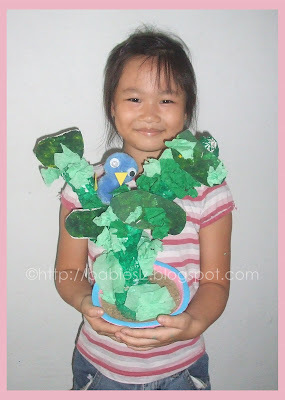 L did this bonzai plant for her last art lesson. 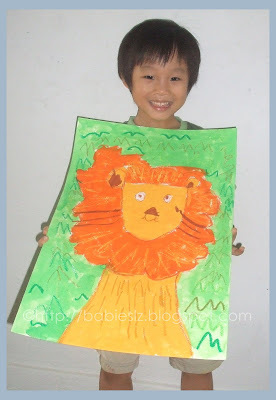 LZ attended their last art lessons... They were a little sad.. So was I. There are so many things that they want to learn and we don't have enough time. 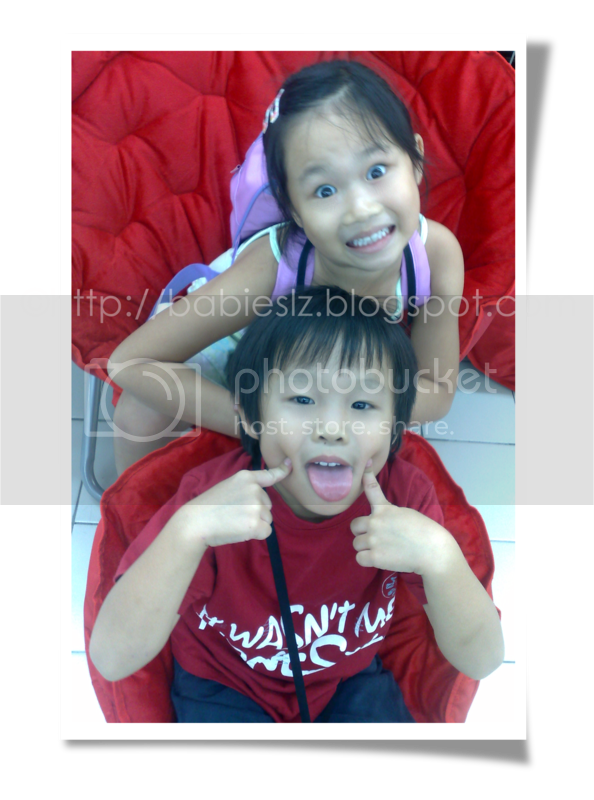 It is tiring for me to ferry them for classes everyday. They know and they understand. So they chose to give up art lessons. That doesn't mean that they will stop doing craft or drawing. 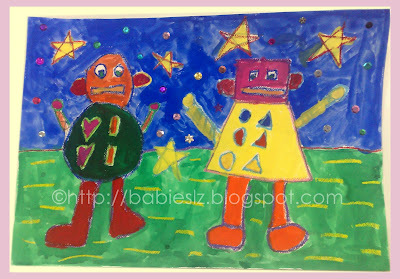 I told them we could do art & craft at home, like we used to before I send them for lessons. I will probably have to start surfing the net for craft ideas. If not, they could draw & paint whatever they want. Teacher Fiqah taught L since the first lesson. When L moved on to the next level, she taught her too. 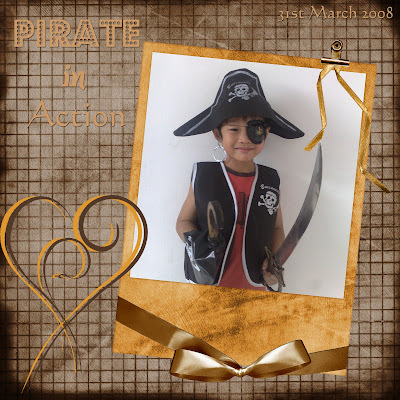 Z was taught by Teacher Tricia in the beginning and then followed by Teacher May (most of the time) when he moved on to the next level. His favourite teacher is Teacher May. 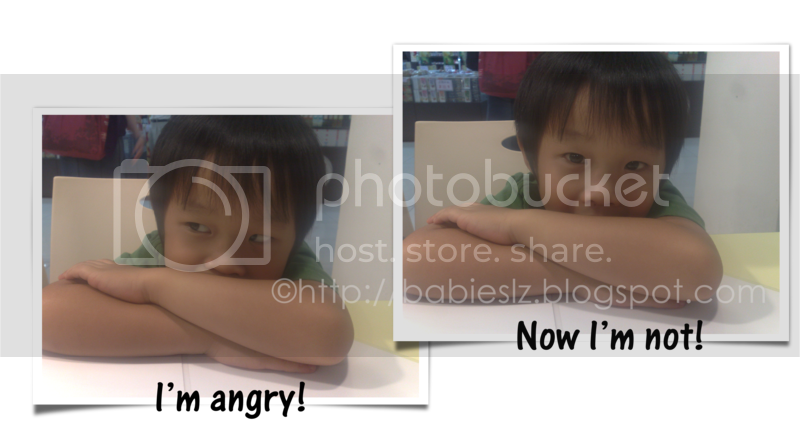 He said he likes Teacher May because she has long hair :) I am so glad that all the teachers has been very nice to LZ. They always give them a very warm welcome when they see them :) Whenever they finished their lessons, the teachers gave them stickers or candies. I was planning to prepare something else but in the end, I made maki today coz Z asked me to make it for lunch today and L said she would like to have it for her bento. 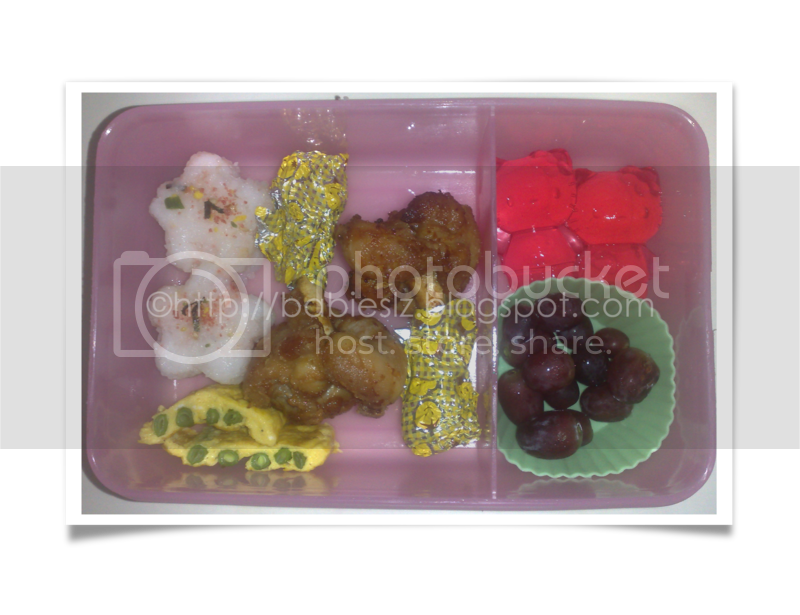 Me : Aiya... Today your bento doesn't look that good! L : No Mommy,they look yummy! Thank you all for showing your concern to L, appreciate it :) As you can see from the previous post, L went to school eventually... She is feeling much better :) I asked teacher how was L in class (after school) and she said she was ok... The teacher didn't even know that L was having bronchitis and on medication. L told me she felt a little drowsy during school hour.. When she told me that, I thought she may not have paid attention in class but I was wrong! She told me what teachers asked them to go through for exams and what she did in class etc. She did her mock up oral today and I'm not sure how she fare... They also did last year papers, seems like the school are preparing them well for the exams. She was very disappointed that she couldn't for swimming lesson this week. She sat quietly in front of the pool and looked at her brother having lesson. I told her to take good care of herself and take her medicine on time then she will be able to join her brother next week. Top tier: Cucumber, baby carrots, quail eggs & diced apples. Bottom tier: Angel hair pasta & salmon. L went to school today.... Poor girl... She was so sleepy when I woke her up. The medicine is making her so drowsy.. I told her if anytime she doesn't feel good, she will tell the teacher and I will fetch her early. She said she has to go to school tomorrow, the teacher will be doing a mock up oral examination with them. This Friday, she will having her oral exam. I'm not sure if she missed it tomorrow, will the teacher do it with her on 1 to 1. I hope she will recover fast... Exams is just round the corner... How is she going to talk when she is coughing so frequently? 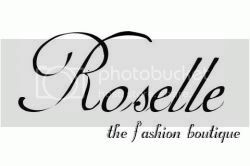 My heartache whenever I hear her cough... I told her to talk less for now but she is a chatty girl... How to stop? From left:Baked ham, tomato & cheese on bread, jellies (again), grapes and cookies. After passing some cookies to my friend, we meet up our friends for dinner. We also bought Z's new school shoes :) He reminded me umpteen times that he needed a white pair of shoes for his class photo-taking session this Thursday. They ran out of stocks for the headsets.... L asked if she can buy the lead for her mechanical pencil. 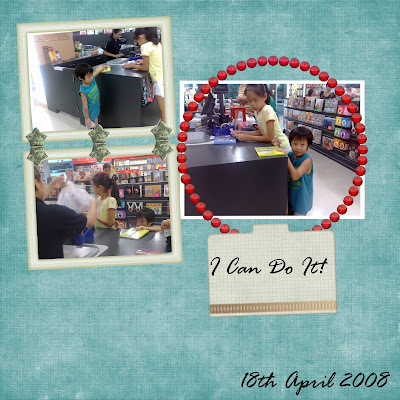 I was happy that she asked :) She remembered what I told her, if she wants to buy anything, she will have to ask. When Z heard that, he said he wanted to buy something too. I told him there isn't anything that he needs from the bookshop and he was upset. He walked away angrily... As my friend was waiting for us, I gave in. Everyday Healy invited me to join a link love chain. Thanks for the tag :) I can't remember when was the last time I did a Tag! Top: Grapes. Bottom: Rice with seaweed, pork with fish paste & spring onion, quail egg with broccoli. Today L said the portion is just right for her. She finished everything! L has been attending creative writing class since beginning of the year. Teacher told me once (after L attended a few lessons) that L liked to 'cut' her story short. She needs to improve on that.... When I told L about it, she said she didn't want her stories to be too long and teacher said it is not necessary to use all the helping words. Since then I have been reminding to use the helping words. 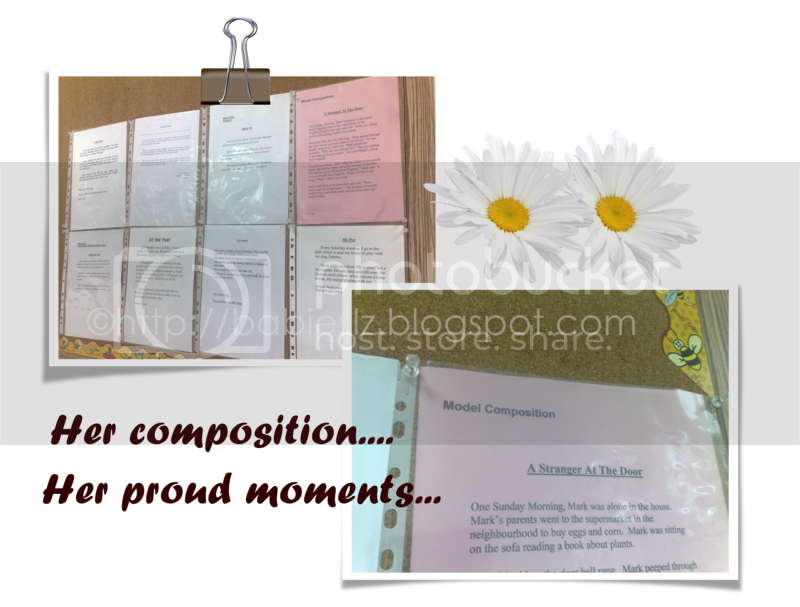 Whenever we are at the center, we see compositions done by the students displayed on the wall along the corridor. I used to think that it was common for the kids' work up there, to recognise their efforts and they take turns to display the children works and so I told L that. She told me that she hope one day, her work will be display on the wall too, just like her best friend. She did that! Teacher Lynn told me that she was very pleased with L's progress and she has shown great improvement. She also told me that the center is very impressed with her 2nd piece of work and decided to use it as a model composition and distribute to other children. Wow! Model composition? I can't believe it! I was very happy! In fact, I am more than happy! L was wondering why I was so happy, she thought it was because her work was displayed. It was more than that. I am happy because she learned from mistakes and she has shown improvement. She was supposed to have her first piece of work displayed at the start of Term 2 but the center lost her first piece of work :( She was very disappointed every week when she didn't see her work on the wall.... Teacher Lynn apologised and asked me to print out another copy of it. sitting on the sofa reading a book about plants. replied, "I am looking for your father. I am his friend from England." him to go away," Mark's father instructed. Mark went to the front door and said, "Sorry, you've got the wrong house." What do you think of it? Honestly, if she was to write this on he own without any helping words, I don't think it will be use as a model composition.. But I am happy that she is able to 'connect' the words and make it into a compostion. 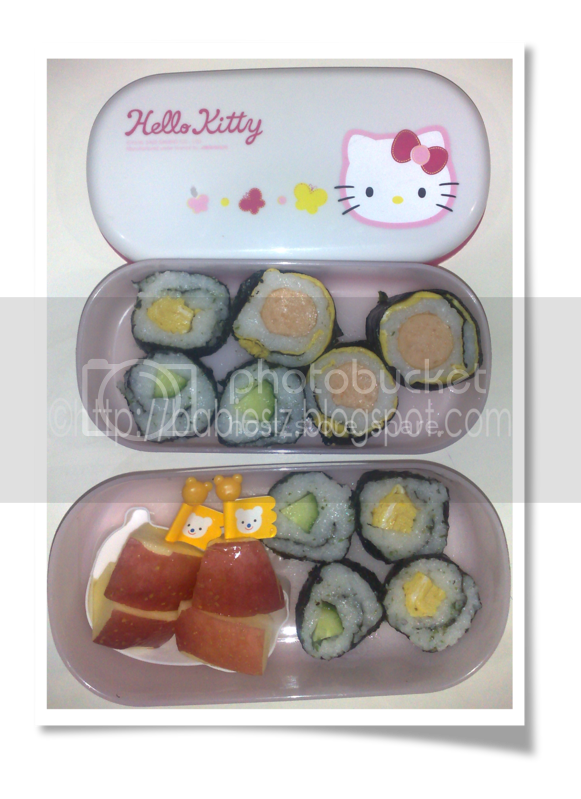 Before bedtime, I asked L if she would like me to prepare bento tomorrow. L : No thanks mommy. I will buy from the canteen. She knew why I prepare bento for her. One of the reasons is that most of the time she eats chicken rice or prata. L : Yes mommy *smile* I am sure. Tomorrow you can wake up later. 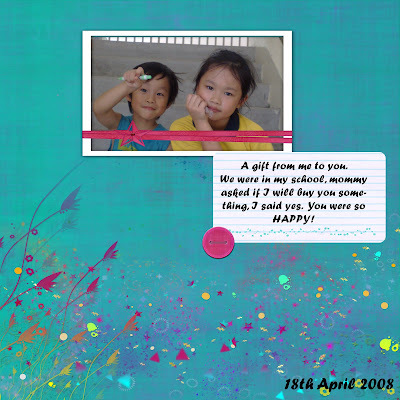 I love you very much Sweetie.... You have always been very thoughtful towards me :) Thank you for being such a wonderful daughter! You know, mommy always enjoys cooking for both of you, so don't worry about me not getting enough sleep. I can sleep earlier instead of spending time in front of the computer. Today, L didn't finished her food except fruit. She said the bell rang before she could finished... That's because she lost her water bottle and she had to queue to get a drink. L is a slow eater, that's one of the reason why I pack food for her, so that she doesn't have to spend time queuing up. LZ like to rush to hide whenever they know daddy is opening to door. They like it when daddy comes home looking for them. But tonight, they made a mistake... It wasn't daddy that was opening the door, it was our neighbour. Z hurt himself while rushing to hide... He knocked against the corner of the coffee table. 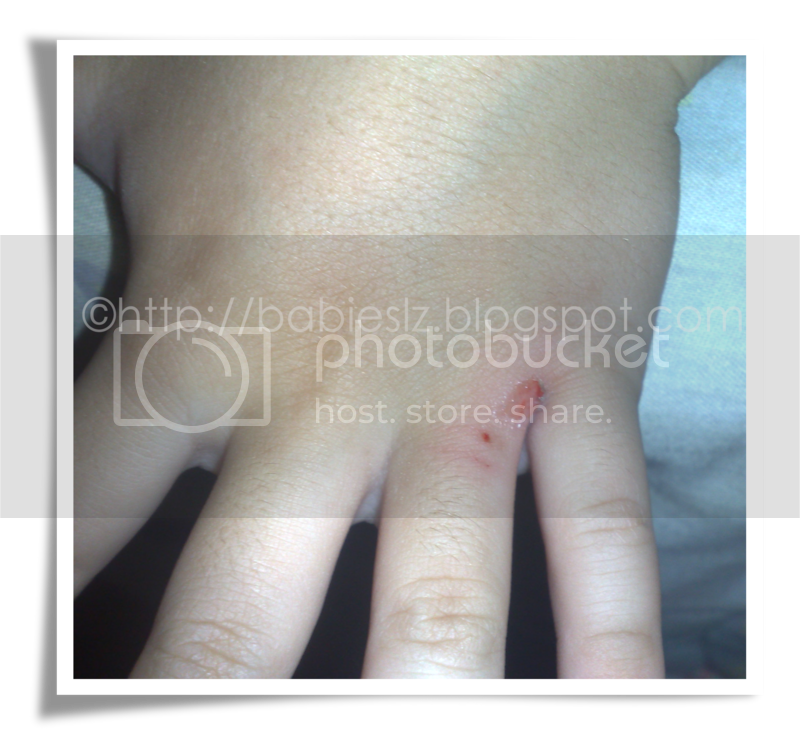 Z : Sorry mommy that I hurt myself. I asked him : Why you apologise to me? Z : Because I know you will feel sad... Please don't tell daddy, later he will scold me. So sweet right? Obviously I can't keep this from daddy. I didn't scold him, he didn't mean to let it happen. 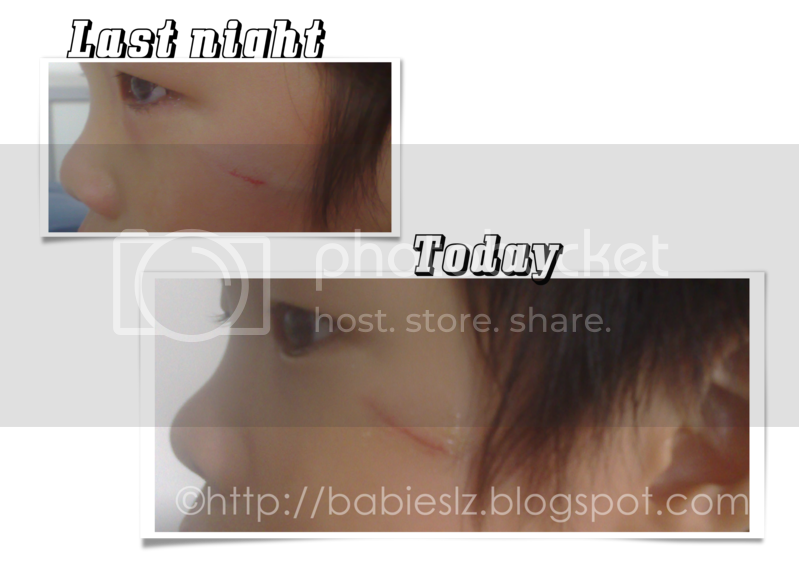 I told him to be more careful and assured him that daddy will not scold him. Daddy didn't see it till this morning. He immediately apologised to daddy..... Daddy feels heartache. He already has a scar above his eyebrow.... Now we hope this will not leave any scar on his face. Me : Spell for me ten. Z : T E N! Me : How about 11? Z : 1 (&) 1! Z : Daddy, no need 快点 , you press the door open button. Then I don''t have to 快点. My Stress Level Going UP!? Today after school, L told me that she has to complete a passage on 我的家人. She has already completed half and quess what? It is written all in Han Yu Pin Yin! *Faint* I asked her why? She said it is easier and faster to complete. Haiz.... I hope she will try to write in Chinese character for the next time. wo xi huan wo de ma ma yin wei ta ye xi huan wo. Wo he di di yi qi wan you xi hai you zhuo gong ke, wo xi huan ta . Wo xi huan wo de ba ba yin wei ta mai wan ju gei wo he di di. Wo xi huan wo de jia ren. Ahhhhhhh! Her exams are coming up! How to get her ready for exams? I think if she has been doing her work regularly, she should be ok... One thing I have to do is to remind her to : CHECK & CHECK her work after she completed it. I'm not sure it is her only or it happens to other children too, she makes careless mistakes. I know coz when I sit with her and ask her to do the sum again, she can do it. Last week, she told me the class monitor and a few boys got a badge each as a reward for outstanding performance in class for the previous term. She was disappointed that she didn't get it and she told me none of the girls got it! Before I could console her, she told me that she will work harder for this term to get one. That's my girl :) With a positive attitude and determination :) She is a tough girl that doesn't give up easily! 加油! 宝贝! 我知道你行的! 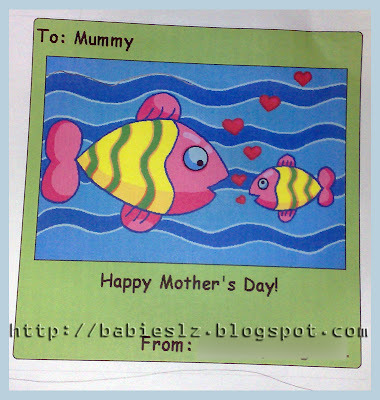 Even if you don't get it, it ok :) You are always the best in mommy''s heart! Oops! One of the two. Hehe.... Cannot leave out your brother right? Weather was great when we were at the pool :) The daddies rather chat than to dip into the pool and it was alright with us. LZ without fail, had lots of fun whenever we are out with our friends. There isn't any pictures from the pool :( I forgot all about it! 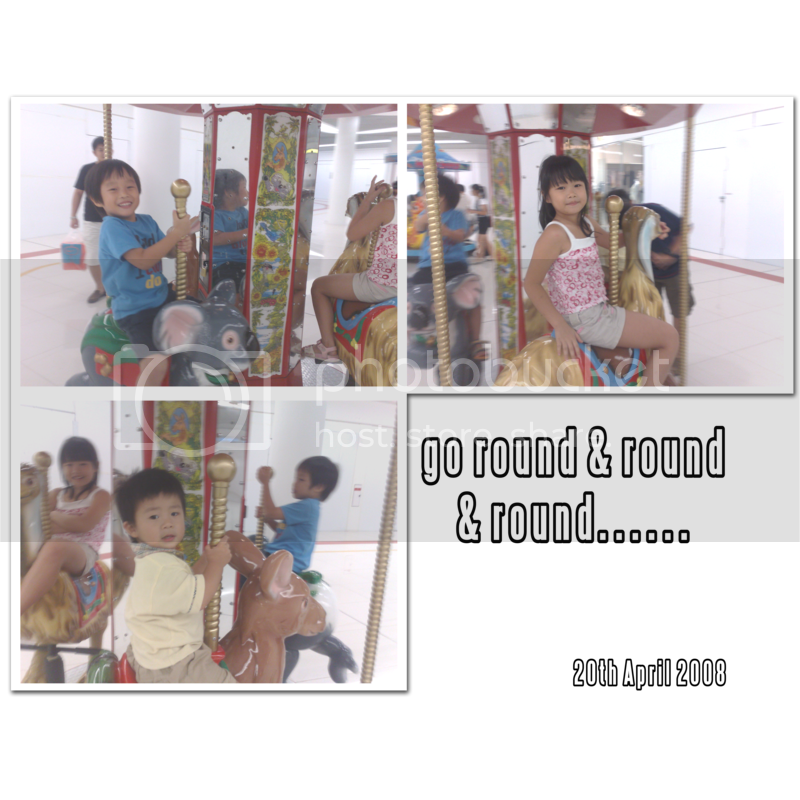 I was busy playing with LZ and chatting with my friends. After dinner, we went to Kallang Airport hawker centre for dinner. It has been ages since I went there. I forgot which hawker served the best food, lucky we had Shirley with us. 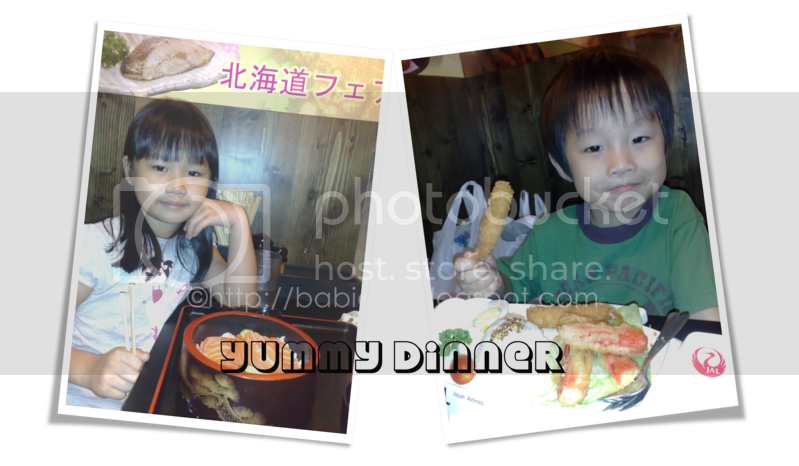 She walked around with me to hunt for yummy food :) Most of the dishes that we ordered, LZdaddy can''t have it. Yes, he is still suffering from Gout. The stubborn man thinks that the pain will go away on its own. I ordered crocodile meat for him, my friend said it is supposed to be good for him. Call me a suaku.... This was the first time I tried it. The auntie was very nice to give us a complimentary soup. We ordered lots of food! Z had mutton soup (his favourite), L ordered yong tou fu and I had fried hokkien mee. We had other dishes too, chicken rice, oyster omelette, lots of satays, otah, 啦啦，etc... I think both my kids have a huge appetite tonight :) Besides finishing what they have ordered, they also ate satays and otahs. Especially Z, he ate more than jiejie! I am soooo tired now... I don't think I will be preparing bento tomorrow... I will probably pack some mini chocolate chip muffin that I baked last night and some fruits. That's what I do, when I am too tired or lazy, I will pack some homemade stuffs for her. Their artwork for this week. He didn't want to initially... I managed to coerced him and the receptionist lured him with sweets too. 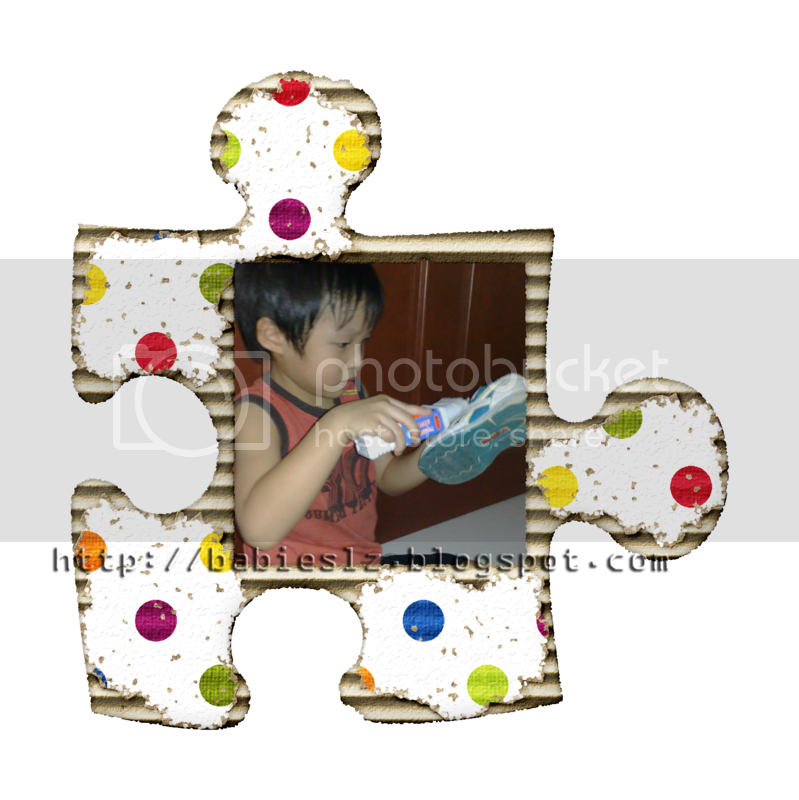 Once he was seated, the lady was very sweet to give him more sweets and biscuits and 'sweet-talked' to him. He was very stiff and didn't moved much except to turn to my side to looked at me :) Once a while, I caught him looking into the mirror, smiling to himself and observing the gorgor cutting his hair. After the haircut, I was $100+ poorer coz I signed up a package with them. 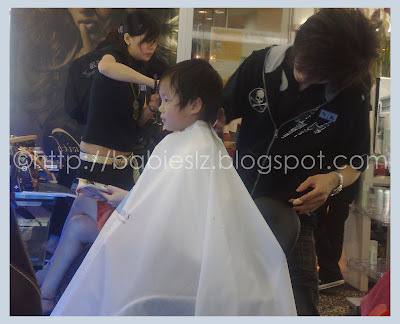 It was cheaper to cut in an adult salon compared to a kids salon. Of coz before I signed the package, I asked him whether he wants to go back there again. If he was not comfortable there, I would not have take up the package. Top tier: strawberries, edamame, fried wanton. Bottom tier: tamago (my style), onigiri with pork floss. Today is a wanton day for us except LZdaddy. He can't have seafood at the moment, so I prepared something else for him... Instead of having fried wanton again for dinner, we had wanton soup. LZ and I never like the wanton from outside (except the ones at Swensen), you can taste the skin more than the meat. Z alone ate at least 10 for dinner today! He have it for snack too! Yesterday, Z's teacher told me that Z praised her, he said she is pretty. She said she was very happy and she will get a present for him (she said it in his presence). Later, I found out from him that he and 2 other classmates said that to her too. Z : Mommy, Ms B did not buy me any present. I thought she said she is going give me one. Me : It 's ok not get a present. When you compliment someone, you don't expect anything in return ok? Z : But she said that. Me : I know... Maybe she forget? Never mind, baby... If every kid says that to her and she has to buy for everyone, then Ms B will have no more money right? At this point, I tried to divert to conversation to something else. Otherwise, what else can I say? I don't understand why the teacher said that. She should know kids remember what they have said. I just hope he will forget about it tomorrow. 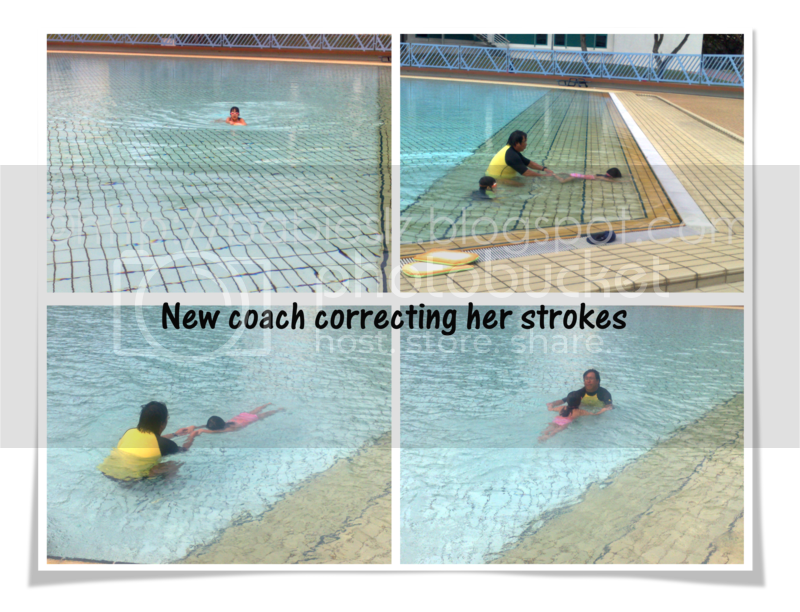 L ended her lesson with the previous coach quite abruptly. It so happened that the last lesson was the 4th lesson for the month and we didn't want to wait for another month to start the lesson with the new coach. 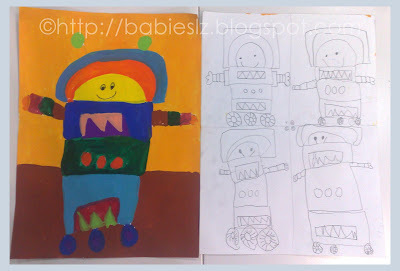 LZ new that they will be having lesson together and they were excited. I was worried L would be upset... I explained to her why we stopped her lesson and I think it is important that I do that. She understood what I have told her and in fact, she is very happy that she can swim together with her brother. Z, he was sooooo excited! Finally he is taking swimming lesson :) I promised to look for a coach for him since end of last year.... I told him whatever I knew about the coach. He looked like he wasn't paying attention but I was wrong... When jiejie came home, he told her everything that I said! Before the lesson, my sis already told me that the coach will be spending some time correcting L's strokes (The current coach knew who was her ex-coach). This was not the first time I heard negative comments about this coach. Haiz... What is done cannot be undone... At least for the past 1 year+, L enjoyed her time with her friends. For the first lesson, he was correcting her hands & legs movements and when to pop her head up to breath (can you imagine after 1 year she still doesn't do it right?). For Z, he taught him to submerge his head fully into the water and hold his breath. He also taught Z a little of the leg movement. I have talked to L and asked her opinion. She loves the idea! 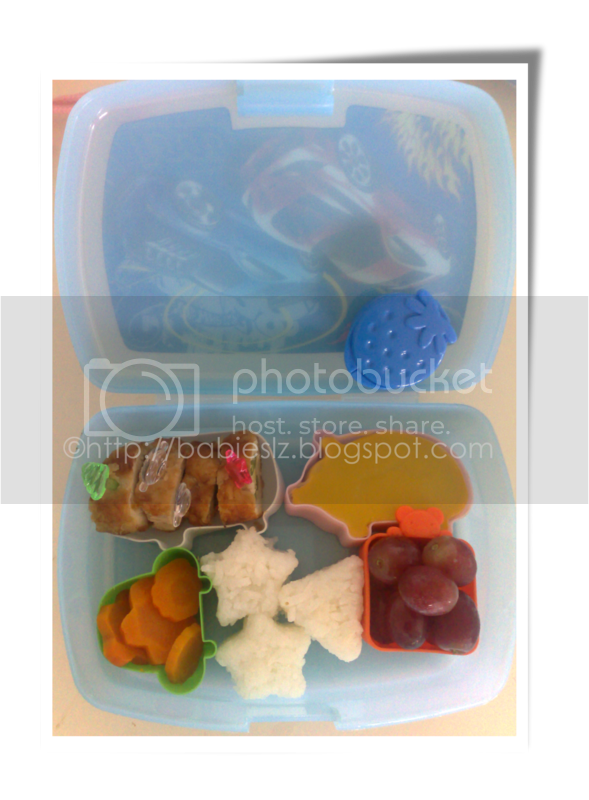 I know my girl supports me, whatever I suggest :) As for Z, I'm not sure if he likes that when he goes to P1, for now, he likes it whenever he has bento(prepared by me). 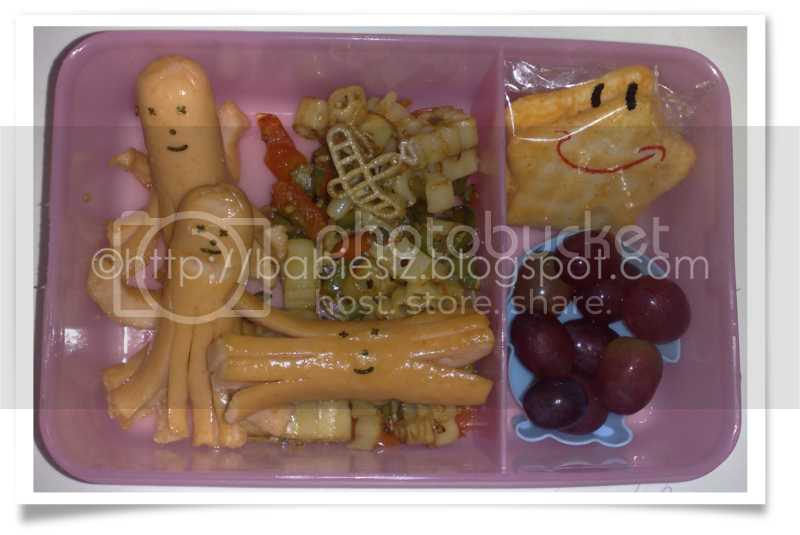 I don't see boys bringing bento to school. When time comes, I will ask him. Maybe when L goes to P2/3, she may not want me to pack it for her. I don't know.... As children grow older, they may feel 'embarrass' about bringing food to school or they want to be independant. 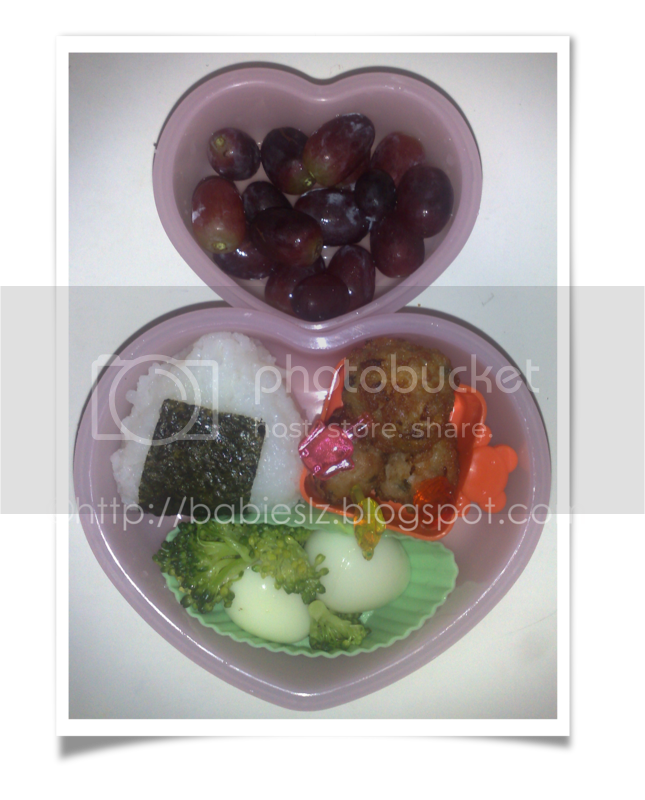 Meantime, I enjoy preparing food for them :) I am new in preparing bento and hope I can do it better for them. I had to cooked 3 times today! 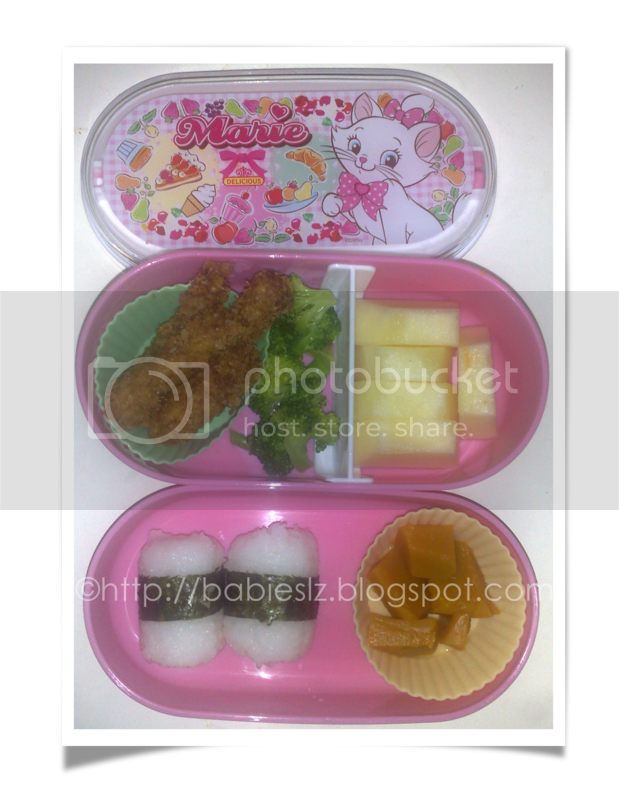 Once for L, her bento for school, then I need to cook again for Z (and lunch) to have it while I was having meeting and last but not least, for dinner. I could have cooked Z's meal together with L's but I wanted it to be fresh when I bring it to school. Errr.... Come to think of it, I actually cook 3 times in a day quite often. This is similar to Bento #19 as both were prepared on the same day. From top left: Chicken rolled with fine beans and babycorn, pig shaped steamed egg, grapes, rice and steamed carrot. The blue container: ketchup. 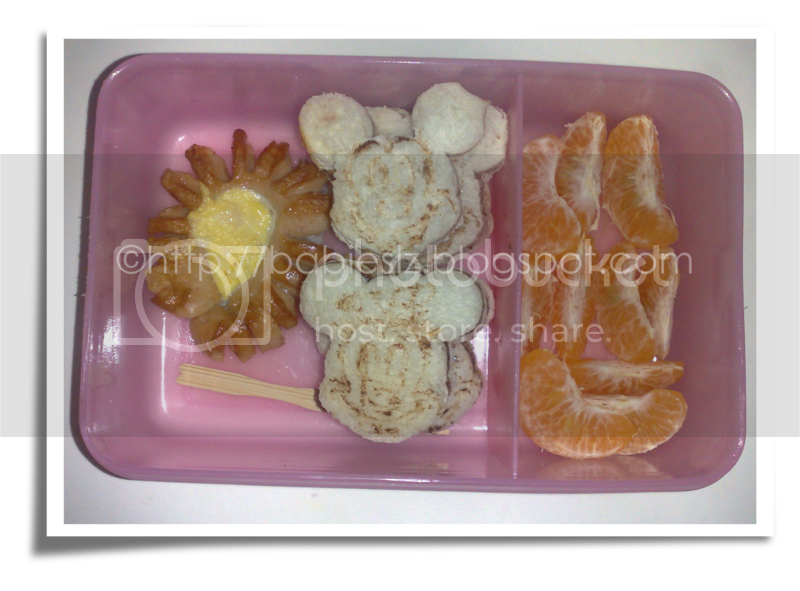 I packed another container (not in the pic) with mandarin orange so that Z can share it with Joash. LZdaddy is worried that I will tired myself out... Having so many things to handle and now I joined another PSG. For those of you who doesn't know me, I don't have a maid, so I have to do household chores as well. I think time management is very important.... I hope I will be able to handle everything. 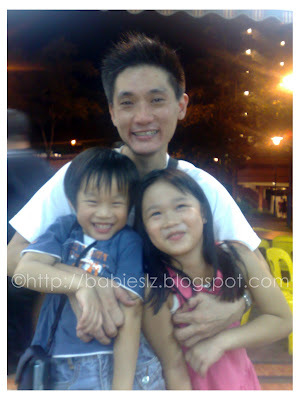 No matter what, I will not compromise on the time spent with my babies and hubby. Left: Thai mandarin orange. Right: steamed carrot, chicken rolled with fine beans & babycorn, rice topped with carrot. In the morning, we went to pray to my late Father-in-law(FIL).... It was LZ first time going there to pray to him. 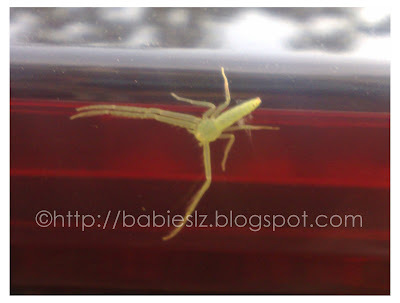 My Mother-in-law (MIL)'s initial plan was to let L goes and leave Z at my Mum's place. Knowing Z, he wouldn't want it. I managed to convince my MIL and both came along. Here's the video of Z when he went for his trial TKD lesson. This will be his last lesson :( He has been very fickle minded, one minute he said he wanted to go for the next lesson and the next, he said he didn't want. Finally, he had made up his mind..... He said tough work (we told him he will have to practice the commands and the moves) and he doesn't want to go for it. Hmmm..... Hopefully he will think of learning it at a later stage. L's school organised a a Mass walk for the lower primary students and it was her 1st Mass walk. I think it was good that the school did that :) They have mass PE on Friday and this is something different from what they usually do. We, PSG members were asked to station at different points to ensure safety. She told me she enjoyed it :) Because she can chats with her friend and she was very happy to see me there. But me blur blur... I didn't even see her! She said she was waving at me(she didn't want to shout for me). I saw her class walked past me and I missed her! Las week, when I was asked by the PSG if I am free to hep out with the mass walk. I told them I will think about it... I was feeling lazy and there are lots of things to do at home so I thought of saying no. L : Mommy, you know we are going for a Mass Walk on Friday? L : How come you know? *pause* Ohh.... The mommies are going to help right? So you are going to be there? Me : You want me to go? Me : But if I go, I will not have time to prepare your bento. Is that ok with you? 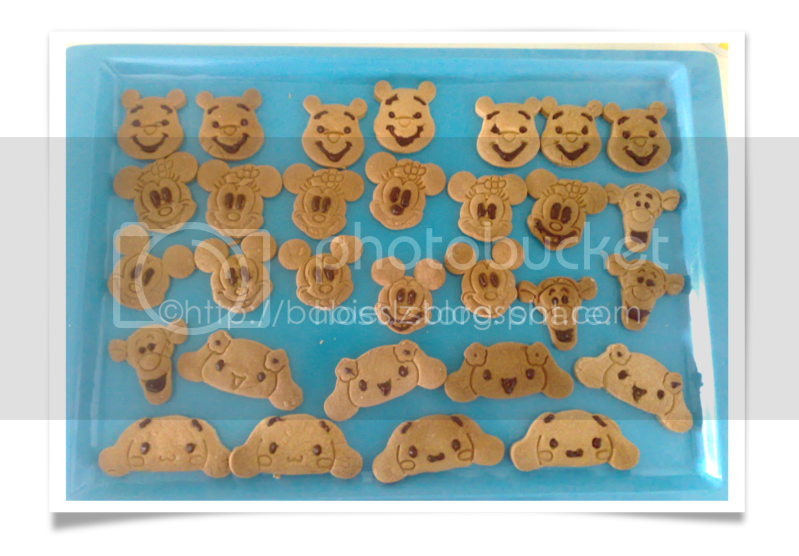 This was prepared according to her request :) She can't wait for me to bake the cookies, so she asked me to use it for her bread instead. The Thai orange is very sweet, if you are interested, you can get it at Cold Storage. 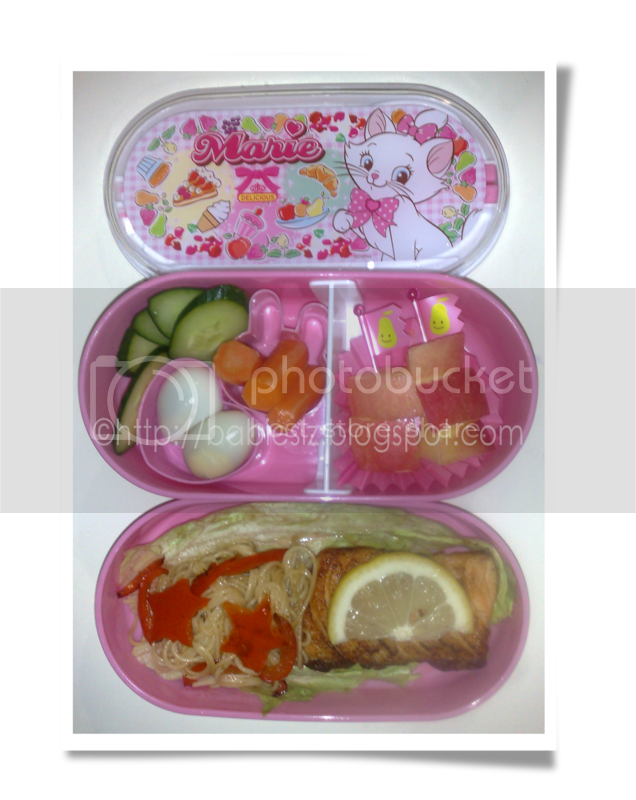 I find that the bento looked very plain :p Anyway, it doesn't really matter to her :) She finished everything! I have been spending too much time watching late night shows (TV programmes) and sitting in front of the computer. LZdaddy is concern that I am not getting enough sleep and I have to wake up early to prepare food for L. I don't mind, so long she enjoys it and finishes everything. It is better than she eats prata or chicken rice in school everyday. Left: papaya. 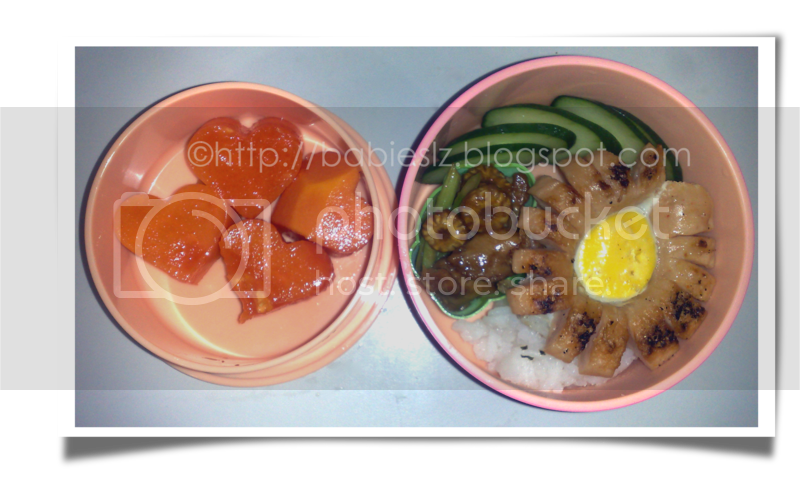 Right: Chicken with asparagus & baby corn (in the container), rice with quail egg & sausage flower on top. 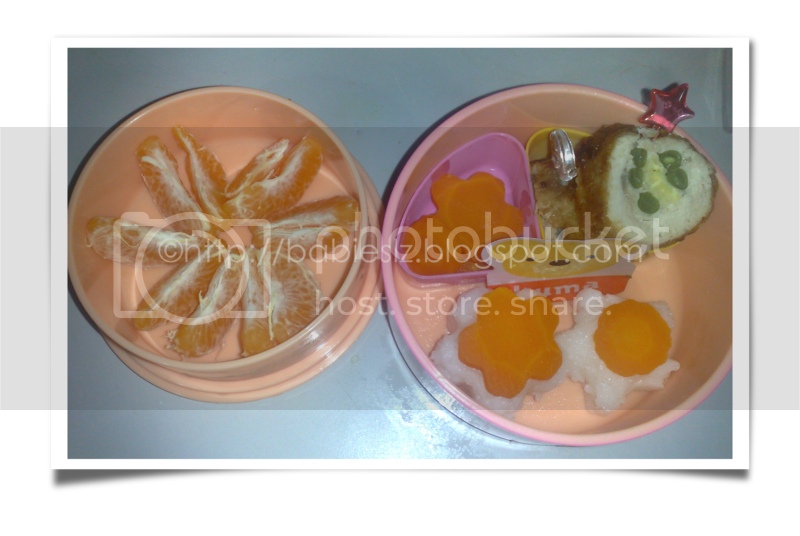 L commmented that she likes today's bento :) Especially the 'flower'. 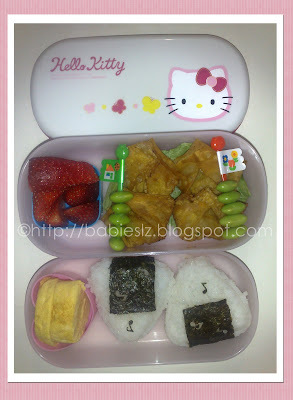 She asked me to prepare that for her next bento again. Look how serious he was!